Approximately 80-90 % of beef eaten in the world comes from dairy production, where unwanted male calves are sold for beef cattle producers. About half of all calves born in a dairy farm are males. The calves stay with their mothers for some days, after which they are transferred usually to group pens with other calves. They are still fed milk, either from buckets, bottles or an automated calf feeder. Between 10-39 days of age these young bulls leave their birth farm. In the Northern Europe, bull calves are sold to a slaughterhouse, which in fact transport the animals forward to another farm. These calf farms continue feeding the calves with milk for about six weeks. At the age of 2-4 months the calves can be considered as "teenagers" - at this stage healthy animals grow 800 - 1400 grams each day! This number varies between cow breeds. For dairy breeds the growth target is ~500 g / day, and ~700 g / day for beef breeds. When the animals weigh 120-180 kilograms (about 3-4 months of age), they may be transported to yet another farm, where they'll stay until they are slaughtered at the age of 16-19 months. Beef cattle in the last, fattening phase. In this case, their living conditions are abysmal. Those farms which buy young or "teen" animals and grow them to adults have constantly a high risk of infective diseases. Animals from different farms carry different bacteria and are immune to different pathogens. It is immensely important to test the new animals especially for salmonella and BVD, and keep new animals strictly in their own sections of the barn. Each pen or section should be filled and emptied once (all in - all out), so it can be properly washed and disinfected between batches of animals. The animals are also very stressed when they arrive to a new farm. They have to get used to the new feed, barn, pen structure, feeding system etc, and yet eb able to stay healthy and grow well. This is a great challenge for the producers. Also, all medications given to cattle must be documented. 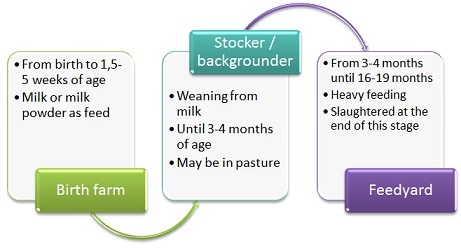 When a live animal is sold, the producer must provide the buyer with information on all medications given to the animal within the last 3 months. The documentation must be done in every farm as long as the animal lives. As mentioned, beef cattle are slaughtered at the age of 16-19 months. At this stage bulls weigh about 300-350 kg, which is half of their adult weight. Heifers should weigh over 200 kilograms. Well, this is informative. Thanks for posting this . I am fairly certain that this information here will be a source of great use to a lot of people.